A new multipurpose facility in west Auckland will not open until 2019. Construction of the library and community centre in Westgate began in March this year with a completion date of late 2018. But it is “expected” to open to the public in early 2019, Auckland Council community facilities manager Rod Sheridan said. This was to enable time to fit out the building, including installing equipment and ensuring everything is set up for staff. The entire building, located on Kohuhu Lane, would have a floor area of about 3600 square metres and cost $26.9 million. Citizen Advice Bureau offices and external public toilets would also be built. Sheridan said construction was underway with structural elements currently being put in place. The entire facility would be an integrated community hub that would enable people to come together to create, explore, connect and participate, he said. “It is designed as a meeting point where the community can access a range of resources and activities, and actively participate in community life.” Exhibitions and community events will be held at the facility. Chairman of the Henderson-Massey Local Board, Shane Henderson, said he was “excited” about the developments occurring in Westgate. “The new multipurpose facility will provide a growing population with a great place to learn and relax in,” he said. Waitakere councillor Linda Cooper has said Westgate was a key area in Auckland for development. 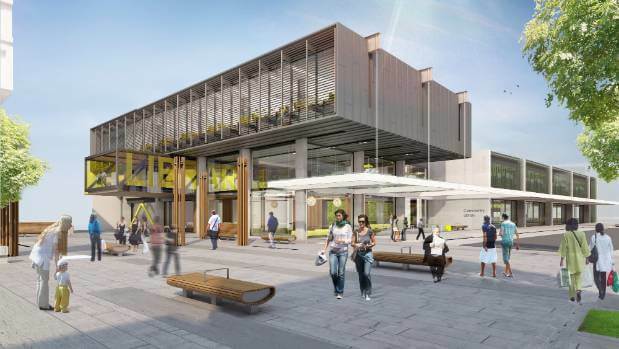 Sheridan said another council development in the area, Te Hauauru Park, located on the corner of Tawhia Drive and Maki Street, was 70 per cent through construction. It was due for completion later this year, he said.